Women took a leading role in the organisation process from its inception because they were suffering the most due to lack of access to forests and their continuous degradation. The most inspiring story is that of Raijabai of Kakrana village on the banks of the Narmada River. The people of that village had begun protecting their forests but peo ple of nearby villages would come at night to cut the trees. Thus it was necessary to have someone police the forests at night also. Then Raijabai took the brave decision to stay in the forest itself and she and her husband constructed a hut there and went to live in it with their children. Whenever they saw somebody trying to cut the trees at night they would raise the alarm and then all the people from the village would come rushing. Even then on a few occasions the timber thieves attacked and injured them. Nevertheless undaunted Raija has gone on living in the forest which has now become a resplendent one. Jashmabai of Darkali village who has got work under MGNREGS due to the organisational abilities of Retli and other KMCS activists candidly explains why she likes the present situation, “Our men are wastrels, spending their time drinking or looting someone. So we decided to do something about it and found work here.” This woman from the Bhilala tribal community speaks for many other women like her living in extreme poverty in a drought-prone region. They had few livelihood options. The land cannot support most families here, because the soil in these small, fragmented homestead plots is poor and unproductive. The mahua trees and toddy palms that dot the region only serve to provide the local men with ample sources of liquor. Poverty and alcohol form a lethal cocktail in Darkali, which manifests itself in crime and violence. Women, as always, emerge from such a situation as the worst sufferers. Even after the work was officially sanctioned, the sarpanch refused to initiate it. That was when Retli decided to go to the work site with the women, and start the work herself by carrying the soil dug out from the site on her head, along with the other workers. 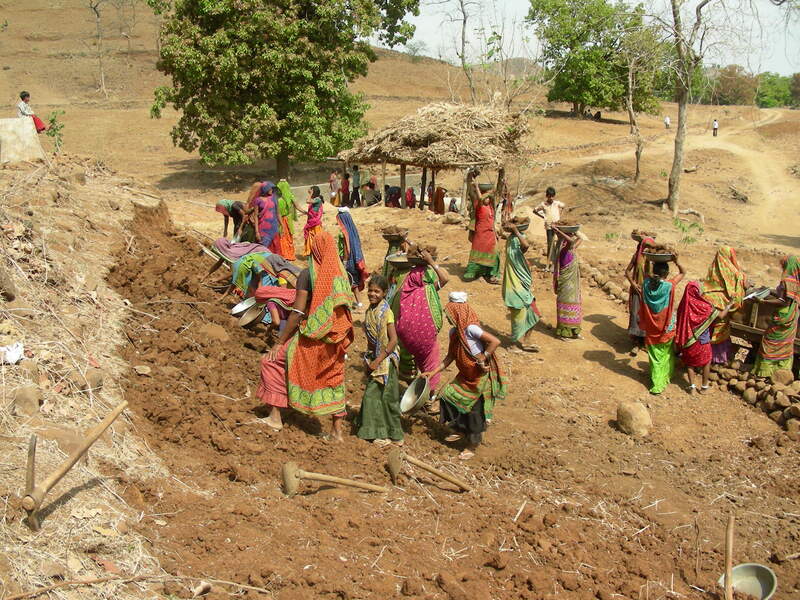 After three days of working like this, the sarpanch had to concede to the demand of the women. Now the situation has settled down, and all the wage payments have been made. They even succeeded in getting a creche to look after the children of the women workers, with two women being paid to look after them. Development projects in rural India have long been a source of corruption, with funds being regularly siphoned off at various levels by bureaucrats and politicians. The MGNREGS has tried to address this by instituting checks like social audits and making it mandatory for wages to be paid directly into bank accounts. But corruption still seeps in, with those in charge sometimes devising ingenious ways to cheat poor workers of their dues, either through personal intimidation or by manipulating registers. Here the vigilance of the KMCS and its activists like Retli along with the villagers ensures that the benefits do accrue to the people. The term gender bender applies to those who behave in a way that is different from the gender assigned to them at birth and generally applies to men who behave like women and women who behave like men in physical and sexual terms. However, the term could also be extended to include those who rebel against the social roles assigned to them by a patriarchal social system. Women like Retli are defying the restricted role given to them by society and taking advantage of new legal provisions under the Forest Rights Act, Panchayati Raj Act and the National Rural Employment Guarantee Act to ensure greater mobility and rights for women. Actualising Women’s Resource Zones is the next step and requires higher skills. Such WRZs have to be implemented and from this experience I am sure a workable model will emerge. While greater participation by women in the public sphere does improve their status in society and some women like, Retli, Vina and Daheli have indeed become quite powerful vis a vis their own husbands and the males as a whole they are still handicapped by the gender division of labour. Women still have to do the care work and also domestic work like cooking and wahsing. This takes up a considerable amount of time of the women and often they have to forego public work. This is in fact a problem that most women are faced with and in the case of poor Bhil women it is even more acute as they tend to have at least three or four children if not more. The solution of course is that men should take on equal responsibility for care and domestic work but given the patriarchal taboo against men doing such work this is very difficult. The Khedut Mazdoor Chetna Sangath has tried to do something in this regard and the village leaders and tribal activists at least do put in some work at home in care and domestic work but there is still a long way to go. The organisation also has a very successful reproductive health programme among poor urban women in the city of Indore. The slums in Indore are mostly populated by poor Dalit and Tribal families who have migrated to the city in search of work. The women residing in these slums suffer from patriarchal oppression and consequent reproductive health problems. Current thinking among feminists broadly defines the discipline of reproductive and sexual health as the social and clinical study of those problems and diseases that arise from the social asymmetries influencing human sexuality and reproduction. Specifically a reproductive health approach has been defined as that which enables women, including adolescents, everywhere to regulate their own fertility safely and effectively by conceiving when they desire, terminating unwanted pregnancies and carrying wanted pregnancies to term; to remain free of disease, disability or death associated with reproduction or sexuality and to bear and raise healthy children. In reality, however, this ideal state of affairs does not prevail anywhere in the world and especially in India most women have to suffer from serious reproductive and sexual health problems. Feminist sociology has pinpointed the dominance of men in society as the prime reason for this and termed this phenomenon as patriarchy. Analysing all the main institutions of society like the family, marriage, kinship groups, media, religious hierarchies and the state, they have shown that all these play a role in maintaining the overall patriarchal structure of society. Over thousands of years this structure has become so well entrenched that to most people including women it seems quite natural instead of being the social construct that it is. As a result traditionally women have had to work more, they have been denied the right to inheritance of property, they have had to assume total responsibility for house work and the care of children and the elderly and this work is not counted as of being of any economic value, they have had to go underfed and have been subjected to domestic and external violence of the worst kind. As a consequence of this secondary status women have to bear more babies to ensure that there are male progeny who will inherit the property and provide security in old age. Along with this there is social control over the sexuality of women so that men can be assured that the children born to their wives are truly theirs and so ensure the purity of their descent. Naturally all this affects the overall health of women and especially their reproductive and sexual health. Since there is a taboo on the discussion of these issues women have to suffer their troubles in silence and this leads to mental problems. Thus there is a deafening culture of silence surrounding women’s reproductive and sexual health problems . The biggest irony is that the menstrual cycle which is an integral part of the reproductive process is considered in the prevailing patriarchal system to be the cause of various negative things and has been given a dirty connotation in India. This affects the ability of women to maintain personal hygiene and results in their being afflicted by various diseases of the reproductive tract. Poor women both tribals and dalits living in slums in Indore have largely remained outside the purview of qualified medical help and have had to rely mostly on quacks. 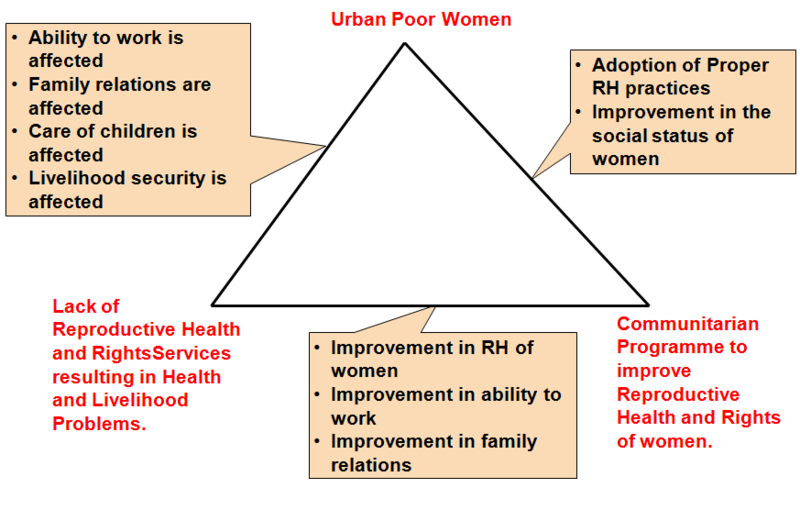 Our organisation has been implementing a participatory reproductive and sexual rights and health programme for poor women in the framework depicted in the figure below. This framework focuses on the reproductive and sexual rights and health problems of poor women and shows how their lack affects the poor women. Our programme to improve this situation has impacted positively on the health, social and economic status of poor women. Earlier we had also conducted this programme among the tribal women of Khargone district and there too it was very successful. Especially a favourite with the women was the weekly mobile clinic that we used to run. 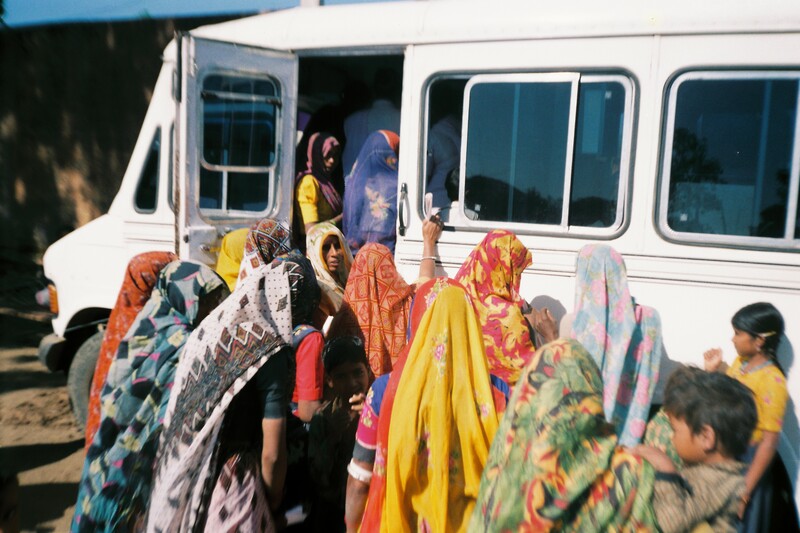 Given below is a picture of women crowding to receive medicines from this mobile clinic.